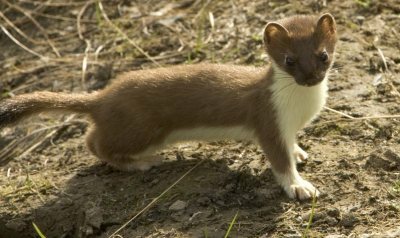 Over my years here in the Corwhin area of Puslinch, I have had several sightings of the Short-tailed Weasel, an animal not easy to spot, due to its astonishingly quick movements. The first was in fall, when my cat, Esther, heard a furious rustle of dried leaves in a row of trees and shrubs, near the swamp and rushed towards it. I discouraged Esther from attacking it, as weasels are ferocious fighters and she might have been injured. A cute, fierce, tiny face emerged and peered curiously at the interlopers. He sported a long body, brown on top with creamy-orange belly, on short legs, and a black-tipped tail less than half the length of his body. He stared boldly, with bright, black eyes in his pointed head, topped with rounded ears. One summer day, my cat, Heavenly, after staking out a spot by the pathway from the house to the barn for several days previous, carried a weasel into the garage and dropped it. It immediately launched a counter-offensive, lunged madly at her, uttering a shrill screech. I grabbed Heavenly and her fascinated companion, Sally, and deposited them in the house until the weasel found its way out again. The Short-tailed Weasel is constantly hunting to acquire the food equivalent of 40% of his body weight, which he requires daily. Our smallest carnivore is searching for the tunnels of his favourite prey – mice, shrews, chipmunks and cottontails. He will also eat birds, fish, eggs, insects and frogs. With his keen sense of smell, hearing, sight and touch, he is as ferocious as he looks. He can climb trees and swims well. He moves in a flash to capture victims in their burrows. If in need of a den, he will appropriate his prey’s premises, using its fur as bedding for a nest, supplementing it with dry grass, leaves and feathers from birds, which have also fallen prey. Should more than his daily requirement of food be garnered, he will store the surplus in a pantry, constructed off the main tunnel. He will create a similar nook for use as a latrine. At dusk one summer evening, I lingered in the back doorway of the garage, enjoying the beauty of the evening before me, when I was distracted by a frantic scratching in the opposite corner of the garage. As I watched, a young mouse appeared in the centre of the floor. In a flash, a weasel rushed out and snatched it. Evidently, our garage was the site of a mouse nest, which the weasel was attempting to uncover. Neither the weasel nor the cats deterred the mice, which shortly set up housekeeping in my car, much to the mystification of the mechanics, who observed the mouse-chewed seat belts and the cat paw prints on the dashboard and enquired about my “critter troubles”. By the way, mothballs do not discourage mice either. However, I digress. Each weasel has its own territory. Females’ areas are smaller, usually not far from where they were born; males range far, encompassing several female territories. The male is twice the size of the female. They are promiscuous, mating in late spring to summer. If the mating is late in the season, the female will give birth the following spring. Four to nine offspring is the average litter. The mother will care for the young, during which time, she will need to eat food equal to 70% of her body weight daily. By 8 weeks of age, they will accompany her on nightly hunts. Aside from breeding season and the rearing of young, the weasel is solitary. Enemies are hawks, owls, coyotes and fox. If the weasel evades these predators and finds sufficient food, usually a challenge, it generally lives about 2 years. One March morning, just as the snow had melted, I saw a white patch among my flower beds and I supposed that I must have dropped a kleenex tissue. On closer examination, it was revealed to be a weasel in its winter coat, which had probably fallen victim to another weasel, upon whose territory it had intruded, as it’s throat had been savagely gashed open. In winter, the Short-tailed Weasel is sought by trappers for its beautiful, pure white coat. It is referred to, then, as ermine, used since time immemorial to adorn the clothing of the rich and royal.